Synopsis: Now into his sixth year at Hogwarts, and after a turbulent fifth year, Harry comes across a mysterious book belonging to someone known as the Half-Blood Prince and begins to delve deeper into Lord Voldemort’s past. There will be spoilers ahead, so if you haven’t read the book or seen the film, turn back now you silly Muggle! Review: The world of Hogwarts may have started off as a delightful adventure for the whole family to enjoy. Yet as the series has gone on, each film has gradually got darker, with some rather bleak events taking place for all who attend Hogwarts School of Witchcraft and Wizardry, in particular for one Harry James Potter. After a traumatic fifth year which culminated in the death of his uncle Sirius, Harry is now one detached individual. Yet, the work must continue to bring down Voldemort, and in this chapter, we learn quite a little bit more about the Dark Lord’s past and how he can be defeated. After boasting some incredible action sequences in the fourth and fifth films, this is significantly reduced here, to allow for significant character development, and not just for Harry but for many others including Dumbledore, Draco Malfoy and Severus Snape. The screenplay by Steve Kloves once again is not perfect, there are some puzzling additions, such as the scene one scene The Burrows which was not present in Rowling’s novel, which just feels a bit out of place. Yet there is some great character development, although some characters are much better fleshed out than others. As with the previous films, there is humour to ensure the gloominess doesn’t become too overbearing. The high standard of visuals is maintained here, and Yates steers the ship excellently through these dark waters. Although the action has given way for some crucial character development, the acting isn’t as good as it could be. The three leads have certainly grown into their roles but this is not applicable for everyone. What’s more, their is something of a lack of chemistry between Harry and new love interest Ginny Weasley (Bonnie Wright), as such you do not just buy their romance, which does detract from the story a little. It’s not cringe inducing but it could be so much better. By contrast, the romance between Ron and Hermione is where a bulk of the humour lies, as it’s a bit off and on between them with a new love interest entering the picture, namely Lavender Brown, but it never feels like a comedy, as the audience knows, it is dark times for all of those who inhabit the wizarding world. Each film boasts a new arrival to the cast, and this time the key new introduction is Jim Broadbent’s Horace Slughorn. 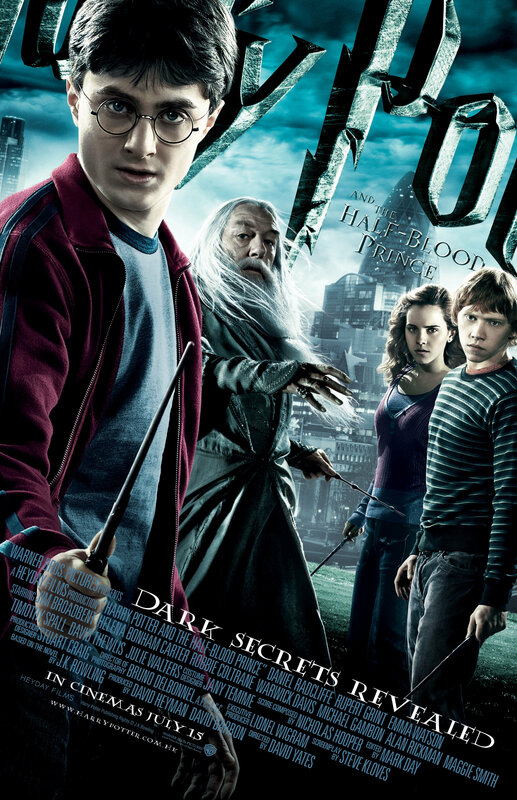 A man who has some crucial information connected to Voldemort’s past that must be obtained in order to defeat him. Broadbent is a welcome addition and reinforces the stellar standard of acting that the more experienced actors, such as Gambon and Rickman provide. Speaking of which, Gambon gives perhaps his best performance yet as Dumbledore, the scenes between him and Harry are extremely well executed and both actors really deliver. Of course this results in the crucial scene which results in Dumbledore’s death at the hands of Snape. Everything about this scene is just masterful in its execution and the resulting aftermath is heartbreaking, but incredibly well realised by Kloves and Yates, and the score by Nicolas Hooper in this sombre scene is just outstanding. Every film has got darker than its predecessor, but with this heartbreaking twist, Hogwarts will never be the same again, and for Harry, there is no to mourn for the loss of Dumbledore, there is work to be done to ensure that Voldemort is defeated. It is the climax that all of these films have been building towards, the battle between good and evil is coming. Darker perhaps than ever before, but with brilliant visuals, and franchise best performances from Radcliffe and Gambon, this is another fine addition to the Potter filmography.